Purple Palace - Every Princess needs one! All her favorite princesses in bright graphics wait on this colorful castle design moonwalk. 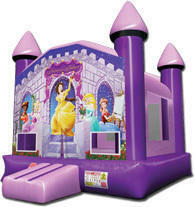 Your princess will enjoys hours of delight with her friends bouncing in their imaginary kingdom. Large netted vent windows keep kids cool inside and allow parents a clear view of activities inside. Suitable for all ages. Unknown. "We had a great experience with Bounce Orlando. You provided excellent customer service and professional employee's. Your company made my son's 2nd birthday a total success. All the kids enjoyed the bounce house and even a few adults took a few minutes to play with the kids in the bounce house. Thanks."